Subscribe to Comments - by email! , we wanted to highlight some of the many Blogger-powered blogs that are focused on the environment, climate change, and sustainability. Want to see more Blog Action Day participants from around the web? Find them on Blog Search. In honor of Blog Action Day, we wanted to highlight some of the many Blogger-powered blogs that are focused on the environment, climate change, and sustainability. Want to see more Blog Action Day participants from around the web? Find them on Blog Search. Have you been enjoying Blogger Play? We introduced it here last month and so far it’s been mesmerizing viewers across the Internet with the latest photos as they’re uploaded to Blogger blogs. 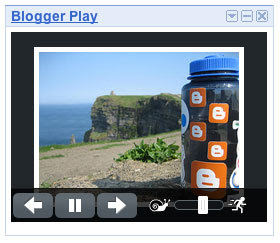 Click the button to get Play on your homepage! We also took the opportunity to add keyboard control to the big version of Blogger Play: spacebar plays and pauses, and the left and right arrow keys move backwards and forwards. book, A Lifetime of Secrets, comes out today and is climbing up the Amazon bestseller charts (it’s #50 as of this writing)! PostSecret is by far one of the most interesting blogs, a showcase of tiny, beautifully-presented personal stories. It has become a favorite Sunday read for many of us on the team. Read it! Congratulations to Frank Warren, whose 4th PostSecret book, A Lifetime of Secrets, comes out today and is climbing up the Amazon bestseller charts (it’s #50 as of this writing)! When it comes to philanthropy, everyone’s got something different to give – some people have money, others have time, and bloggers have devoted readers. The creative folks at DonorsChoose have a few ideas about how bloggers can help students and teachers. In case you’re not familiar with DonorsChoose, it’s a site where teachers post needs they have for their classrooms, and donors fund those projects directly. If you’ve got a blog, a website, or even an email account, you can help by creating what’s called a challenge. Just pick some of your favorite projects and challenge your family, friends, and readers to fund them. 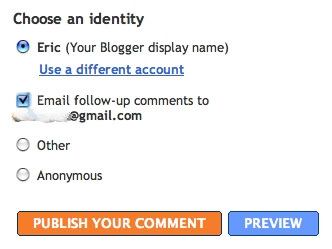 If you’ve got a Blogger account, it’s easy to add your challenge to your blog in just a few clicks. To support their recent expansion to schools all across the U.S., the DonorsChoose team is holding a little competition, keeping track of which bloggers and webmasters drive the most funding to schools. We think this is a cool idea, so we want to help it succeed. We’re going to reward the winning bloggers with exactly what they gave to DonorsChoose, students, and teachers: traffic. The competition will remain open until the end of October - we'll then take a look to see who has helped raise the most money in each of the eight DonorsChoose challenge categories. We’ll post links to the winners’ blogs here, and we’ll also throw in a $500 gift certificate for each winner to spend on DonorsChoose. So here’s our challenge to you: go create a challenge on DonorsChoose.